The stomach is part of the digestive system. It is an internal organ between the oesophagus and the small intestines. 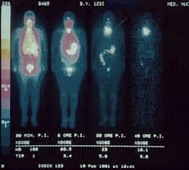 The stomach is the third stage in the digestive process. It holds food after ingestion. 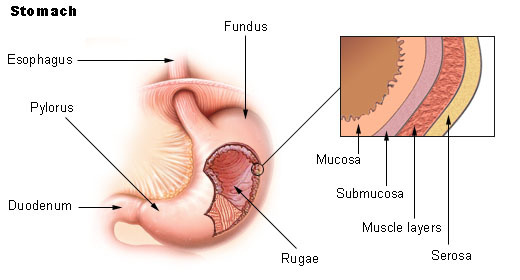 Food in the stomach then passes through to the small intestine where most of the food's nutrition is absorbed. 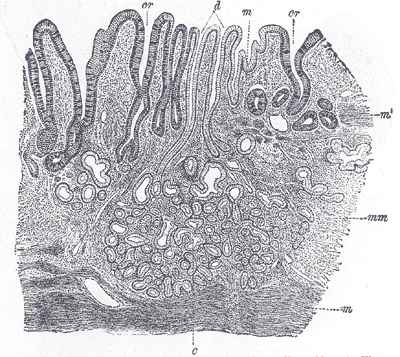 Micrograph showing a cross section of the human stomach wall, in the body portion of the stomach. H&E stain. Stomach Facts for Kids. Kiddle Encyclopedia.